The private spaceflight company SpaceX will forge ahead with a Dragon cargo ship launch to the International Space Station on Monday (April 14) despite a backup computer failure on the station that will force NASA to perform a spacewalk repair, possibly as early as next week. The NASA decision sets the stage for SpaceX to launch a Falcon 9 rocket carrying the robotic Dragon spacecraft from a pad on Florida's Cape Canaveral Air Force Station. 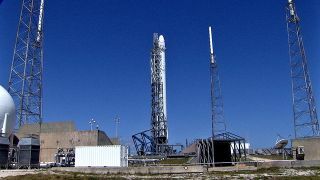 Liftoff is set for 4:58 p.m. EDT (2058 GMT) on Monday, with the Dragon due to arrive at the station two days later. In a press conference Sunday (April 13), NASA station program manager Michael Suffredini said the decision to move forward with the SpaceX launch came after an in-depth analysis of the Friday failure of a backup computer for the station's solar arrays, robotic arm rail car and other systems. The system's primary computer is working fine, and engineers devised workarounds that would safeguard the station's power and robotic systems in case of another failure, he added. "We're just trying to fly as soon as we safely can, which is what we believe we're doing with this [plan]," Suffredini told reporters. The Dragon launch has been delayed since March due to unrelated damage to a ground-based tracking radar used by the Cape Canaveral Air Force Station. SpaceX's third Dragon spacecraft cargo delivery to the International Space Station is packed with big science for astronauts on the International Space Station. See a rundown of the weird science riding SpaceX's CRS-3 Dragon mission to the space station in this Space.com infographic. The failed backup computer is known in NASA parlance as a Multiplexer-Demultiplexer, or MDM, and is one of more than a dozen such devices used to route commands to various systems on the space station. It failed late Friday (April 11) when flight controllers on Earth attempted to activate it. Suffredini said astronauts will eventually have to perform a spacewalk to replace the broken MDM computer, possibly as soon as April 22. The International Space Station is home to two American astronauts, one Japanese astronaut and three Russian cosmonauts. NASA plans to decide who will perform the spacewalk later today, Suffredini said. "This would be one of the simplest that we could do," Suffredini said of the spacewalk. The actual spacewalk would last about 2.5 hours and require two astronauts to swap out one 50-lb. (22.6 kg) MDM computer one of several spares on the station. SpaceX's upcoming launch will mark the Hawthorne, Calif.-based company's third cargo delivery mission since 2012 under a $1.6 billion contract with NASA for 12 resupply flights using the Dragon spacecraft and Falcon 9 rockets. Another company, company is Orbital Sciences Corp. of Dulles, Va., also has a $1.9 billion NASA contract for eight cargo using its own Antares rockets and Cygnus spacecraft. Space legs:Prehensile legs for NASA's humanoid Robonaut 2 droid on the station. Veggie: A mini-farm experiment to let astronauts grow lettuce in space. MERCURRI: A microbe experiment orchestrated by NBA and NFL cheerleaders. Phonesat 2.5: A tiny smartphone-powered satellite designed by NASA. SpaceX will also deploy a set of four tiny pods carrying other small satellites as a secondary payload on the Falcon 9 rocket, according to Hans Koenigsmann, the company's vice president of mission assurance. Koenigsmann said the Falcon 9 launching on Monday is also equipped with four landing legs, each one measuring 25 feet (7.6 meters) long, as part of a reusable rocket technology experiment. Last year, SpaceX successfully demonstrated that it could launch a satellite into orbit, then relight the nine rocket engines on its falling Falcon 9 booster's first stage to slow its descent back to Earth. For Monday's test, that re-entry maneuver will be accompanied by a landing maneuver with the goal of delivering the Falcon 9 first stage to a preselected "landing" zone in the Atlantic Ocean. If all goes well, the rocket would descend upright as if making a vertical landing, then topple over into the ocean to be retrieved by a recovery team, Koenigsmann said. But SpaceX stresses the demonstration is an experimental technique. The chances of success are low, between 30 and 40 percent, Koenigsmann said. "If we pull this off … we'll be super-thrilled," he added. Visit Space.com for complete coverage of SpaceX's Dragon launch to the International Space Station. You can also get blow-by-blow mission updates the Mission Status Center of Space.com partner Spaceflight Now, which will also feature a launch webcast.